Flashback on the genesis and life of the Kalayaan project (…) Kapatiran, Liberty (…) Fraternity ; an individual, collective, poetic, photographic experience. From its creation during a oloronaise night until its expositon at the Cultural Center of the Philippines in Manila. The project was born a few days before our artistic event, the Révol’ution, where we are several artists opening their spaces for a night opening, in and around the rue de Révol in Oloron-Sainte-Marie, looking for an idea to liven up my studio, the espace Existences. After an inspired sleepless night, the concept is there: ask visitors for a photo, each one pronouncing a letter, to create a visual alphabet composed of these oloronaises mouths. Write with this alphabet our national motto, born during the French Revolution, Liberty, Equality, Fraternity, driven by the ambition to create links with the Philippines, declining it in different languages of the archipelago! If translating the motto in the official language of the Philippines, Tagalog (or Filipino) is easy, it takes the help of many Filipino friends from different regions, to obtain at the end 16 different languages versions, even some indigenous languages. Artistic, graphic design side, 4 visuals are created from these translations, the first is the presentation of the 40 volunteers from the mouths Révol’ution. The second, a composition of the motto in the official language, 3 rows corresponding to the 3 words. The third presents 7 key languages, by number of inhabitants, located according to their geographical origin. A fourth are few variations in secondary languages, on a map of the archipelago . In Davao City, the southern capital of the Philippines, are presented as the first models of these compositions during the Liwanag Festival (January 29 to February 2, 2013), whose theme is creativity and sustainable development. It is interesting to present to the Filipino audience, mostly students, teachers and artists, a graphical approach to which they are unaccustomed. 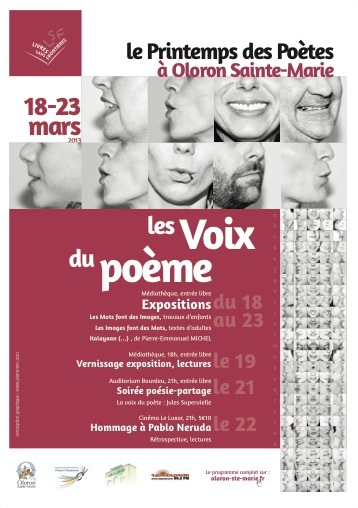 Coming back from the Philippines, it was the Printemps des Poètes, spring of Poetry, whose theme this year is the Voice (another inspirational idea behind the concept), the artworks are presented in France, part of the exhibition at the library Confluence in Oloron-Sainte-Marie. In addition, a little video loop is broadcasted, where translations are presented in a hypnotic sequence. A few months later, at the 4th Révol’ution, June 22, 2013, where I invite Bruno Laxague, is just represented a new version of the video, with colors. After this exhibition, the fresco, printed on a resistant tarp, is sent by the Education Department of the Cultural Center of the Philippines in Tacloban city, in the center of the country, ravaged the previous winter by the super typhoon Hayian, making thousands of dead and millions of displaced people, with the ambition to recycled it, reused as roof, a wall to shelter, or bags, etc. The opening was also the opportunity to take photos of Filipino volunteers, for the creation of a new alphabet, a new version of the concept, with a different theme, new compositions. To be continued!